Sarah Nader - snader@shawmedia.com Owner of Northwestern Lawn and Landscape Jonathan Rupe pumps water away from a house on Hampshire Lane in Lakewood Wednesday, July 26, 2017. 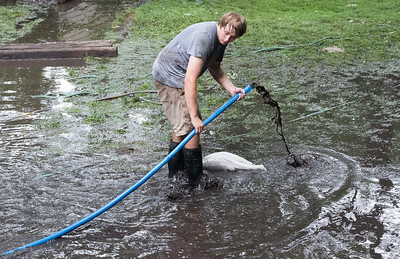 Flooding is backing up some residents septic tanks in the neighborhood. 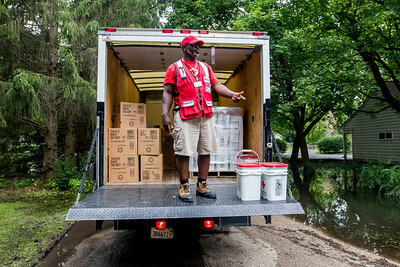 Sarah Nader - snader@shawmedia.com Red Cross volunteer Ernesto Lindsey of Homewood, Ill. drops off supplies to Lakewood residents in need on Hampshire Lane Wednesday, July 26, 2017. 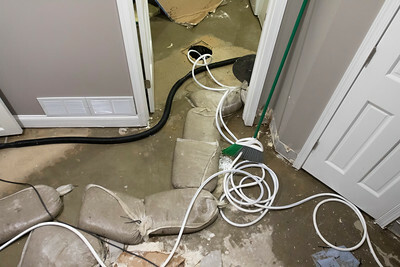 Flooding is backing up some residents septic tanks. Sarah Nader - snader@shawmedia.com Neighbors Mike Stitch (left) and Lucy Lee of Lakewood talk outside their homes on Hampshire Lane Wednesday, July 26, 2017. Flooding is backing up some residents septic tanks in the neighborhood. Sarah Nader - snader@shawmedia.com Owner of Northwestern Lawn and Landscape Jonathan Rupe lays sandbags around a Lakewood home and pumps water away from the house on Hampshire Lane Wednesday, July 26, 2017. 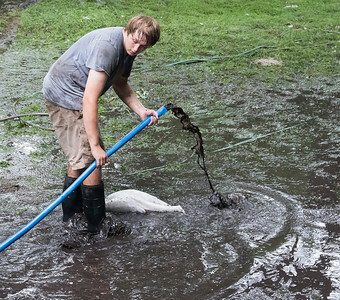 Flooding is backing up some residents septic tanks in the neighborhood. Sarah Nader - snader@shawmedia.com Cleanup continues in the basement at a home on Hampshire Lane in Lakewood Wednesday, July 26, 2017. Flooding is backing up some residents septic tanks in the neighborhood. 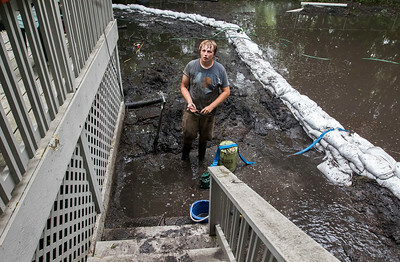 Owner of Northwestern Lawn and Landscape Jonathan Rupe lays sandbags around a Lakewood home and pumps water away from the house on Hampshire Lane Wednesday, July 26, 2017. Flooding is backing up some residents septic tanks in the neighborhood.